Sarah Carroll has been invited to present the e-commerce lessons learned from her new book ‘Grow Fast, Grow Global‘ at a session during E-Commerce Week, organised by the United Nations Conference on Trade and Development (UNCTAD) and International Trade Centre (ITC) and will join a panel for the session: ‘Understanding into action: e-commerce skills development for Africa’s entrepreneurs’. Alongside other speakers, the session will present analysis of how firms in developing countries – and Africa in particular – can be supported to acquire the necessary skills to flourish and succeed in the e-commerce ecosystem. What skills are missing among private sector firms and intermediaries? How can they be assisted in acquiring the skills and experience needed? What has experience from the field shown about what works? 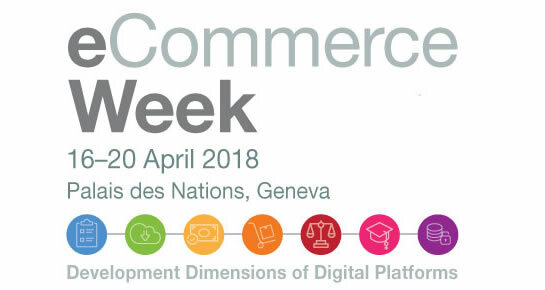 If you would like to meet with Sarah in Geneva and are attending E-Commerce Week 2018, get in touch to set a time.